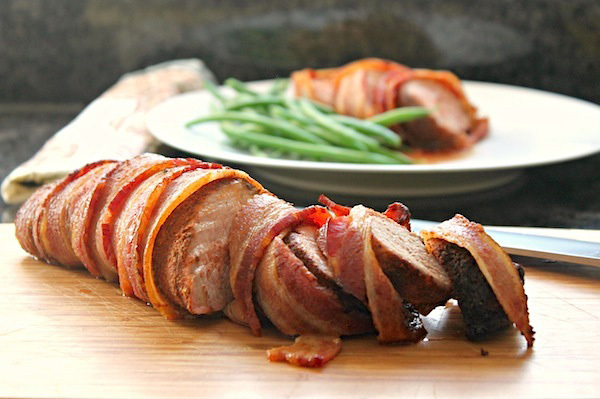 Spice-rubbed pork tenderloin wrapped in bacon is surprisingly quick and easy! Elegant enough for company… yet perfect for a weeknight family dinner! Why not serve this pork tenderloin dish with hot mashed potatoes, French string beans and a homemade warm applesauce?! The combination of flavors and textures will keep people coming back for seconds and thirds. Preheat oven to 425 degrees F. In a large zip-closed bag, add brown sugar, chili powder, garlic powder, cumin and thyme. Lock bag and shake all around to mix spices. Add pork tenderloin to the bag with the spices and shake around again to coat the pork completely. Remove your pork tenderloin from the bag, lay it horizontally across the middle of the bacon and wrap the bacon up around the tenderloin, securing by pressing down. 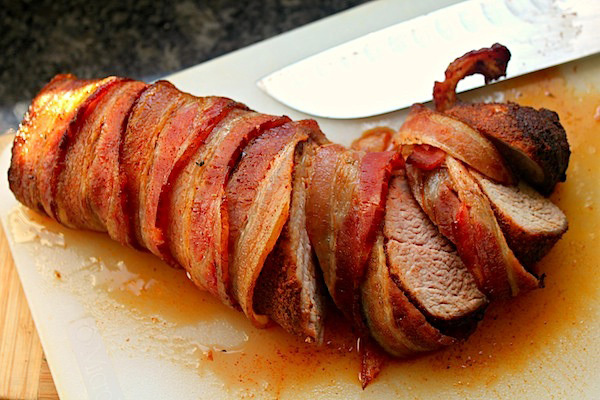 Place the bacon-wrapped tenderloin seam side down and cook for 15 minutes. Turn the temperature down to 375 degrees F and cook an additional 5-8 minutes or until the internal temperature of the pork reaches 145 degrees F after resting. Internal temperatures of cooked meat will continue to rise for a few minutes after removing from the oven. Use an internal probe meat thermometer and set it to go off at 135 degrees F, then remove from the oven and let meat rest about 5-6 minutes.